Carolyn and Andrew had such a brilliant dive off Cistern in Coopers Bay and came back on board bubbling with excitement over the fish and scenery. 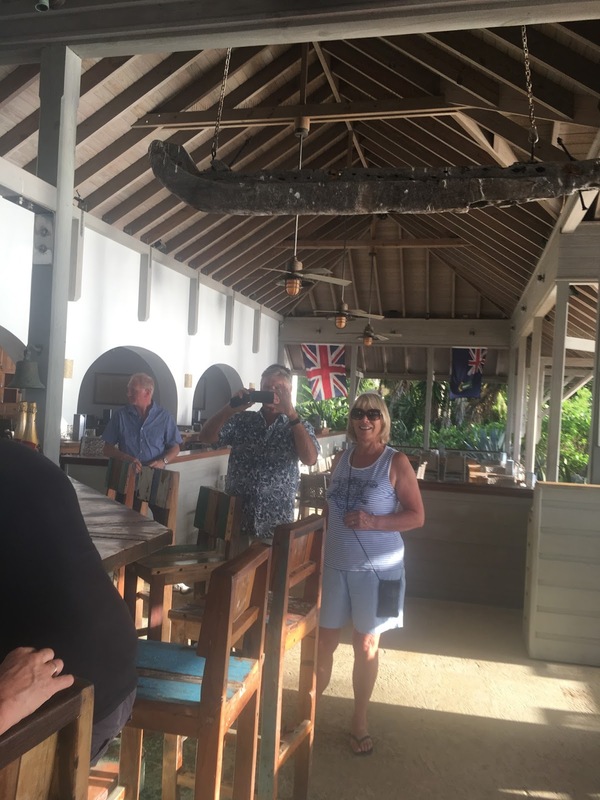 We all went ashore to The Beach Club for happy hour drinks - every place makes a slightly different "painkiller", so one just has to try them! and we also watched a beautiful sunset from the bar on the beach. As Cooper's Bay is slightly open to the ocean we did suffer a slightly uncomfortable rolly night, but woke in good spirits and Carolyn offered to take us off for a snorkel to the same area. We were thrilled by the reef/cliff colours and textures, the different fan corals and huge shoals of fish swimming lazily about - definitely getting better at getting back into the dinghy now! Wouldn't have missed that snorkel for anything. On our return to Askari, Andrew had got all their scuba gear ready, so they donned their sealskins, etc and went off in 'Askooby' to dive on The RMS Rhone wreck site off Salt Island. This is a famous dive site. The Rhone, an early post boat, went down during a hurricane with a huge loss of life in 1867 - the boat had tried to weigh anchor during a lull in the storm however a shackle got caught and the anchor broke free leaving the captain no choice but to head to sea, they had nearly cleared the last point off Salt Island when the next blow from the hurricane struck forcing her onto the rocks where she broke in two and sank. Parts of the BVI chain are designated National Parks and one can't anchor there or pick up buoys without having paid a huge premium for a permit, so it was easier to take a long dinghy ride. 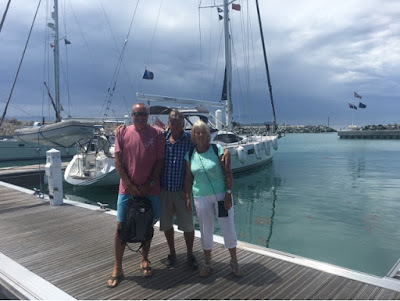 Thrilled with the best dive they had had in The BVI's, C&A returned to get us ready for a gentle motor to our next port of call, Peter Island, which is a privately owned Resort Island set in what is known as The Channel Island Chain off Tortola. We passed Salt Island, Deadman's Bay, Sprat Bay and turned into Great Harbour, anchoring in very deep water, but fairly close to the beach. One of the advantages over the many charter catamarans is the amount of chain Askari carries, so we could anchor easily in deep water and the electric windlass made life much easier for our lovely deckhand, Carolyn, simply operating the equipment with her toe! Counting down the metres laid as they rolled out. We went ashore to explore and found a beautiful beach resort where we were welcomed by Management to tour the facilities and use the wifi and bar! No second guessing where we headed! What an exclusive place, with beautiful manicured gardens teaming with birds and plants, plus very comfortable beach chairs and an amazing view over the silver sand and sapphire sea. We had to take our leave and wander back through the mangroves to our bay, but not before Carolyn had downloaded the latest weather information, which wasn't good for the following day! After a very hot and humid night and waking to overcast skies, our Skipper decided as there was change in weather conditions I.e. NO wind, he contacted Nanny Cay Marina, where we were booked for our final night, to see if we could have a berth a day earlier - fortunately affirmative! Askari was readied for a motor sail across the Channel back to Tortola and the marina there. It felt strange to be able to walk ashore, but great to be plugged into the mains so that the a/c could operate, but not before Andrew did a complete check on the supply to ensure we would receive the correct voltage, which entailed Carolyn having to call the Dock Master to reorganise our supply, very important as incorrect voltage could damage Askari's entire system. Tree of shame at Nanny Cay - our outboard propeller probably belong here too! We went ashore to explore the complex and found useful shops and, of course, a convenient snack bar for lunch. Leaving Andrew to service the engine and start preparations for their long sail north next week, Carolyn organised a taxi to take us into Road Town, the capital of the island. Unfortunately two huge cruise ships had docked that day and the town was teeming with folk all wandering about in their plastic capes - it was also pouring with rain. We did find an interesting Folk Museum and had a wander through the delightful old part of the town, but the weather got the better of us and we picked up a taxi back to the marina. The sun came out again after lunch, so we took ourselves off to the pool complex for our final chance of some tan topping up! We had booked into the restaurant again for our final supper and had a lovely meal, dining on beautiful tuna sashimi and calimari for starters and Mahi Mahi fish for mains - delicious! Our taxi was booked for 10.30am, so it was time to pack and say our farewells- so hard after such a lovely time. CJ, our driver, took us over the top ridge on our way to Beef Island giving us the opportunity for one final look at the wonderful vista of the island chain set out below and then down to cross the Causeway between Tortola and Beef Island. Really enjoyed your account and so pleased you had such a great time. Wiil be in touch soon.